Respawn Entertainment know how to have a bit of hidden fun with their games. In every level of both Titanfall and Titanfall 2 players could find a hidden Nessie plush toy – and now it’s been revealed that a larger Nessie easter egg is hidden in Apex Legends, culminating in the appearance of Nessie herself off the east coast of King’s Canyon. We’ll show you exactly how to experience this yourself with our in-depth Apex Legends Nessie Easter Egg guide. We’ll walk you through all the challenging steps of finding and shooting each hidden Nessie toy, so you too can see Nessie herself in all her (morning) glory. 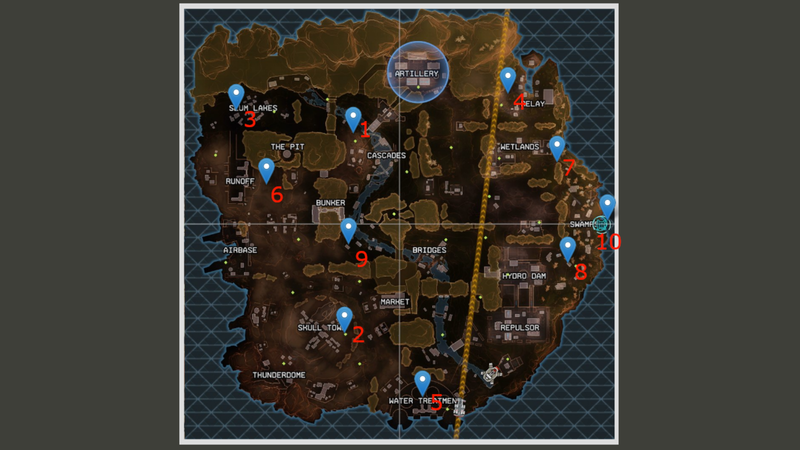 While you’re here, if you’re looking for more general info on Apex Legends, a great place to start would be our Apex Legends tips/guide, which is packed with tonnes of tips and explanations along with links to other areas of our guides series, such as Apex Legends guns/weapons and Apex Legends map and locations. Why not take a look? All this news of Nessie’s arrival into Apex Legends was kickstarted by players noticing a hidden Nessie plush toy in the Training Level of Apex Legends. After this, it didn’t take long before players found a similar Nessie toy hidden within King’s Canyon, the battle royale map itself. The game was on. In record time, a dedicated team of Reddit users (having created their own subreddit to discuss their findings) found out that in order to unlock the full easter egg, you must shoot the Nessie toy in-game in order for another to appear elsewhere on the map. If you shoot that one, another appears elsewhere. It turns out there are ten of these hidden Nessie toys, each one spawned by shooting the previous one; and if you shoot them all in the correct order in a single match, then you can summon Nessie herself from the depths. Though we’re not entirely sure whether that’s her head and neck rising from the depths or… something else. Regardless, let’s dive into each of the Nessie toy locations one by one so you can complete this easter egg challenge for yourself! It is likely that the search for all the locations of the Nessie toys were sped along considerably by a recent datamining attempt, which culminated in one Reddit user (whose account has since been deleted) posting a full map of every single Nessie Toy location. Click the image above to view it at full resolution. It can be quite a challenge to shoot all ten in a single match when there are 57 other players gunning for you throughout, so we’d suggest getting together a team of three players who are all focused on the goal of finding and shooting each Nessie toy. Due to the locations, we’d recommend that one player takes numbers 1/3/6, another player takes 2/5/9, and the third player takes 4/7/8/10. Even so, you’re likely to find yourself having to wade outside the Ring and into damage-over-time territory, so it’s important to loot up a little bit during your adventure so that you have the healing items to keep yourself sustained to the end of the challenge. Note: the screenshots below were all taken from this YouTube video. Take note of the minimap in each screenshot in order to pinpoint the exact locations. Nessie #2 is again right next to a Respawn Beacon – the same pond, in fact. It’s on the east side of Skull Town below the leviathan skull, you can’t miss it. The third Nessie toy can be found having a swim in the waters in the western half of Slum Lakes, beneath one of the support beams that attach the large pipes there to the ground. Yet again found very near a Respawn Beacon, Nessie #4 can be found next to the waterfall on the western side of Relay in the top-right of the map. It’s in the water right next to the northern cliffside, right where the cliff bulges out a bit on the corner. This one’s on the other side of the map from Nessie#4, which is why doing this as a team is probably the way to go. This Nessie can be found on the inner edge of the third-western-most cylinder in Water Treatment. Just the head and neck is poking out for this one, so make sure you check around carefully. Seriously, what is it with the Nessies loving Respawn Beacons? Nessie #6 can be found to the east of Runoff, in the same pond as where those supply bins are clustered around the Respawn Beacon. There’s a tiny gap between the enormous cliffs that separate Wetlands from Swamp, and underneath the waterfall there you’ll find the elusive Nessie #7. This one’s tricky to spot because of the splashing everywhere, to keep your eyes peeled for it. Take a look to the east of Hydro Dam on your map, and you’ll see yet another Respawn Beacon hugging the coast of the island. Head inside the hut to the immediate west of that Beacon, and in the corner of the hut you’ll find Nessie #8. Nearly done! Now you’ve got to quickly travel to the cluster of huts around the river just below Bunker. Nessie #9 can be found in the water, hugging the rock next to the south-western-most hut in that area. The big finale! The final Nessie toy is found next to another rock on the very, very eastern edge of the map next to the centre of Swamp. Shoot this final adorable little plush, and then look out towards the eastern sea in order to witness the spectacularly phallic arrival of Nessie, the Loch Ness Monster herself. And that’s all there is to it! Again, we’d suggest attempting this challenging task as a team, rather than on your own, because it involves a great deal of travel and you never know when you might run into a team that will end your challenge prematurely. But as long as you’re all up to the task, you’ll be saying hello to Nessie in person in no time.